The planet Mars is referred to as the "Red Planet" because it appears red in color. Red Planet Day honors our celestial neighbor, the fourth planet in the solar system. Is Mars truly red in color? Scientists debated this question, even after the Mars Rovers landed and began to explore the planet. Why? Because the lenses used to take photos are tinted. 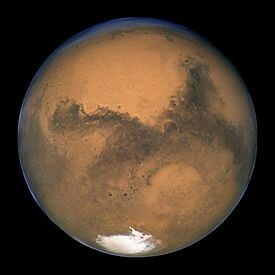 On Red Planet Day, take a few minutes to look upwards into the sky, and gaze at our neighbor. Hopefully, you will have a cloudless night sky for viewing. You can also recognize this day by reading up about Mars, and viewing pictures of it. There are plenty of pictures online. We've noted some of those sites below in the "More Information"section. Red Planet Day commemorates the launch of the Spacecraft Mariner 4 on November 28,1964. The 228 day mission of Mariner 4 brought the spacecraft within 6,118 miles of Mars on July 14, 1965. Moons: Mars has two moons. Deimos and Phobos.